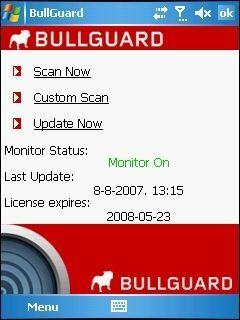 BullGuard Mobile Security is an easy-to-use and reliable antivirus software for mobile phone that provides complete protection against viruses, spyware, theft, malwares, and digital fraud. Bullguard Mobile Security features privacy protections that keep the contacts and calendar safe and allow users to locate phone using GPS to apply functions like lock, wipe, backup, alarm, remotely from a web based interface. In addition, it will scan all incoming traffic like SMS and MMS messages, Bluetooth, emails and downloads for malicious programs. Bullguard Mobile Security normally cost $30 per single license. 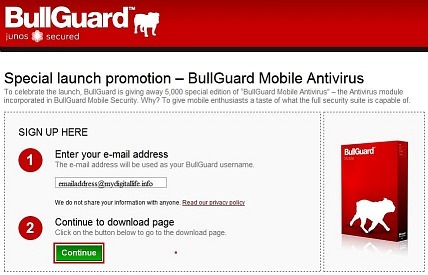 As part of special launch promotion, BullGuard is giving away 5,000 special edition of BullGuard Mobile Security. Fill in the form by enter the email address, and then click on “Continue” button. An email from “BullGuard Technologies” will be sent to registered email containing the link to download the setup installer and a license key code for Bullguard Mobile Security. Select “Install Manually” and choose the appropriate version for the device to enjoy the fully licensed Bullguard Mobile Security. BullGuard Mobile Security is available in multiple languages for Windows Mobile, Android, Blackberry and Symbian operating system.